On An Overgrown Path: Are $1 million music prizes a good thing? Are $1 million music prizes a good thing? I also hold the view that not only does awarding very large amounts of money to established artists bring little benefit to classical music as a whole, but it also reinforces the widespread misconception that classical music is rich and elitist - see the typical media coverage above. 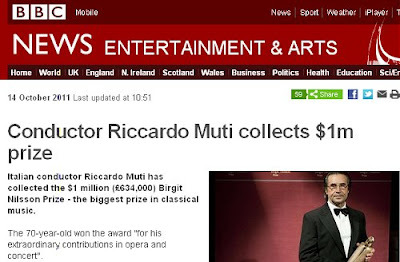 Domingo and Muti may well use some, or all, the money to benefit others. But, if this is the case, would not the Birgit Nilsson Prize be far more beneficial if it was $1 million to be awarded by the winner to not yet established musicians of their choice? However, I am always happy to be proved wrong. Please add your views as comments, and to give the less well rewarded 99% a voice there will be a voting widget on the question 'Are $1 million music prizes a good thing?' alongside this article until 28th October. Totally agree with this post in your series most of all... think what a $1 million bursary could do for a school or a college to fund young singers. Really irresponsible of Nilsson. I seem to recall that as a debate got started on another blog re the first award to Domingo, I pointed out that this was in line with Nilsson's wishes. That was a while back, so I can only hope that I couched it in such terms as to make clear that I thought it ludicrous and I had no idea what her rationale. I think there is a financial award in music which is given to a distinguished artist who, in turn, selects one or more aspiring young artists to receive funding out of the money. I can't recall the name of it, but, if I'm correct, perhaps someone else may know. There is now such in the field of playwrighting, the Ellen Stewart Award. That has just been awarded to Sam Shepard, who will in turn select a young theatre artist to receive funding for the creation of a new work. On the other hand, the Harold and Mimi Steinberg Charitable Trust not long ago gave a nice gift of $200,000 to a playwright who had under his belt a Pulitzer, an Emmy, and two Tonys, and that money was all for his needy self. As Gavin rightly says, $1 million dispensed as college bursaries could do wonders. Or perhaps dispensed as grants to small instrumental groups composed of exceptionally talented but still struggling young musicians (NOT to symphony orchestras). To young and manifestly talented composers for the purpose of writing a new work. To young singers or instrumentalists who have demonstrated exceptional ability but would benefit from further studies with a master teacher/artist (but NOT for another music competition). The possibilities and variations on this theme are so many, and I'm sure other readers could add ideas more imaginative than mine. But I see no point in the enterprise unless the money goes to the young and demonstrably talented in need of funding, whether for further study or breathing room to create, or to schools and colleges for use as bursaries and/or scholarships (NOT Yale, or any other institution rich as Croesus). If a charity or trust has a particularly large bounty, they could found a college. The Philippa Schuyler African American School of Music would be nice. If the money were sourced from public funds, then this award would definitely be in bad taste, but if it comes from Ms. Nilsson's estate, then we'll just have to grin and bear it. Jay, sadly I think you are right and unless the estate changes the nature of the award we will have to grin and bear it. But the overwhelming opinion seems to be that the award is, to use Philip Amos' description, ludicrous. For instance Gavin Plumley, whose opnion I respect, says "Really irresponsible of Nilsson". Perhaps the estate will realise that the award is working against, rather than for, the memory of Birgit Nilsson and change the terms of the award. Dear Bob, Thanks so much. I too wonder about the effect or rightness of such a prize. But I really just wanted to make clear both the background and the funding of the Birgit Nilsson Prize. All best . . . Thanks for that Andrew and your contribution is appreciated. It is rather sad that all the evidence at this point suggests that the Birgit Nilsson Award is seen by the majority as ludicrous. Surely time for the foundation to have a re-think? I suggested in my post making the award $1 million dollars to be used by the winner to help not yet established artists. Surely this change could be made without undermining Ms Nilsson's good intentions?